Kayala: 10 Sunday B: Who is Your Real Family? 10 Sunday B: Who is Your Real Family? Verses 20 and 21: the attitude of Jesus’ relatives. They are typical of people who because of their status think they take charge of Jesus but in fact do not understand him at all. Verses 31 to 35: a second story of Jesus and his relatives. A dramatic meeting between Jesus and his relatives; they are totally out of his sphere and he has understood this and accepted it. and wanted to take charge of them. This always happens when Jesus comes into the world. Lord, we pray for your church, that we may always be humble. enables us to judge who is doing the work of the devil. What hope is there for us then? they can always hear your word and turn back to you. how can we hear your call to repentance and ask your forgiveness? we do many things to help those in need. Lord, we pray for parents. in those who share their sacred values. 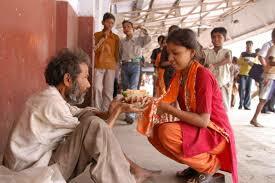 their age-groups, or their social class in the service of others. the call of mother and brothers outside asking for them. in those who do your will. Who is the family of Jesus? Jesus seems here to disown his family. Does he dismiss Mary and his family? He knew that he was not going down well with the family, and maybe wanted some distance from them. It is interesting that they came for him, maybe to take him home. But he turns the family table. He expands his notion of the family. Coming from God his father he proclaims that all around him are family to him – these are his mother, brother and sister. He will later teach them to pray, not My Father, but Our Father. This is one of the central teachings of Jesus, that we are all brothers and sisters, because of our Father in heaven. From this truth that Jesus felt so strongly came much of his preaching – to retreat each other as family at its best would. This follows on from the debate about good and bad religion of earlier weeks. The best of religion treats us all as brothers and sisters because of God. Our first and last belonging is that we belong to God – we come from God and go to God. There will often be conflict in Jesus’ family about him. His first family did not take easily to his new family – his disciples. Only at Pentecost around the mother of Jesus would both families unite. His words are words to us today – he looks around at us and sees us as his brothers and sisters. This will make a difference as to how we see each other. The Jesus who calls his disciples to be a united “house” and community is dismissed by his own “house” as “out of his mind.” Apologizing for his exorbitant claims about himself and his challenging their most cherished traditions and revered institutions, his family attempts to bring Jesus home. The Jesus who comes to be a vehicle of unity among God’s people calls on his hearers to be united in faith and spirit in him in seeking God’s will in all things. The Gospel Jesus destroys the barriers created by race, culture, wealth and social status. He speaks of a new, united human family: the family of God. To fail or refuse to build God’s kingdom of grace is to “blaspheme” against the Spirit of God: to be so mired in cynicism and skepticism that we refuse to embrace the possibilities for realizing the hope of God’s grace. For Jesus, the crushing pessimism that God’s grace is inaccessible to us condemns us to lives of sadness and isolation, not the lives of meaning and joy God envisions for us. Jesus the “lunatic” comes to heal us of what is, in fact, our own “lunacy” – the lunacy of allowing pettiness, pride, anger, prejudice, and self-centeredness to alienate us from one another, the lunacy” of exalting “me” at the expense of others’ basic necessities, the lunacy of constantly grabbing as much as we can as fast as we can while many on this planet have nothing. Sometimes we act out of a self-centeredness that is of “Satan” and not out of the compassionate spirit of the Gospel Jesus — and, without fail, the “house” we have built on a foundation of self-centeredness collapses in anger and hurt. If a house that is a real home is to stand, it must be constructed out of forgiveness, humility, and generosity; to build it of “cheaper” materials, to compromise the integrity of the structure by placing one’s own interest over that of the family is to invite disaster. Jesus’ life is testimony to the reality that the “power” of “Beelzebub” cannot heal or restore or re-create — only the Spirit of God can bring about such transformation. Jesus comes as the means of unity among God’s people, to reconcile humanity to God and to one another, to instill a deeper understanding and appreciation of our sacred dignity as being made in God’s image. We are called, as the Church of the new covenant, to seek in every person the humanity we all share that comes from God, the Father of all and the Giver of everything that is good. The first reading describes the pathetic efforts of Adam and Eve to shift the blame of their sin from themselves on to the serpent and even to God himself. Whenever we do wrong we tend to make excuses for ourselves. We do not like to own responsibility for the wrong we have done. We also see the consequences of sin: loss of intimacy with God and a breakdown between man and woman – the man betrays the woman. However, this sad scene ends with a promise of salvation. The Gospel shows this promise as fulfilled in Jesus who overthrows the kingdom of Satan and establishes the kingdom of God. I’d like to suggest that the Devil has been particularly successful in giving us one piece of truth from which we have made a religious belief: the portrait of a benign, sweet, marshmallow Jesus. We Christians have focused on passages like, “Learn from me for I am meek and humble of heart” and ignored counterbalancing passages such as, “I have come not to bring peace but division.” In today’s gospel we have just such a Christ, a demanding figure, the very Lord of division. Raising the young man from the dead and returning him to his powerless widowed mother was Jesus’ most forceful way of teaching that evil and sinfulness do not win out in this imperfect world. He was pronouncing that love and kindness and peacefulness are, in the last analysis, the greatest strengths in the human condition, and that violence and hatred and spitefulness are the weapons of fools. The wisdom of the world often seems to proclaim just the opposite. Human beings cry out: “If you are too thoughtful, people will walk all over you.” An old saying constantly advises us. “Fight fire with fire.” Even a certain spirit of athletes tell us, “Nice guys don’t win ball games.” The widow’s experience speaks of a different reality. There is no way to prove conclusively that life triumphs over death, that good triumphs over evil, that nonviolence triumphs over violence. We simply must take Jesus’ word for it. Jesus promised to empower the powerless, to give hope to those who have no hope! Darryl Stinger was a wide receiver for the New England patriots in the 1970s. He was hit in a game with the Oakland Raiders and left paralyzed from the chest down. Today he can only use one hand and gets around in an electric wheelchair. Darryl insists that in some ways his life is better now. Looking back at his pro football days, he says, “I had tunnel vision. All I wanted was to be the best athlete I could, and a lot of things were overlooked. Now I have come back to them. This is a rebirth for me…. I really have a lot more meaning and purpose to live for now.” Those are incredible words from a young man whose dreams of stardom lie buried in an electric wheelchair. But you hear similar things from others who have suffered similar tragedies. They all talk about a personal ‘resurrection’ to new life. They also testify to the central mystery of our faith. Jesus is risen, alive and active in people’s lives today. Compassion – the embrace of God! At a retreat for peace, conducted in Los Angeles by Thick Nhat Hanh, a Vietnamese monk, some American veterans of the War were invited to attend and share their stories. A veteran told how one day during the war he captured a young Vietnamese soldier. With his hands clasped on his head, the Vietnamese soldier captive fell down on his knees and crawled. Moved by the look of absolute terror in his enemy’s eyes, the American soldier began to ask him questions through an interpreter: “How old are you?” “Nineteen.” “So am I.” “What do you do?” “I’m a student.” “So am I.” “Do you have a girlfriend?” “Yes” “So do I.” Then reaching into his haversack, the young American pulled out a tin of beans, gave it to his enemy and let him go. At first the Vietnamese ran as fast as he could, zigzagging back and forth for fear he would be shot in the back. Then suddenly he turned, raised the tin of beans high over his head, bowed a deep bow and disappeared into the jungle. For this Vietnamese soldier a tin of beans was a feast to be shared. From that day on the young American soldier marched with his gun turned down.” –Everyday there may be an opportunity to show compassion in action. Do I look for them? In the winter of 1855, in Iowa, the snow fell early in November. The storm was such that neither man nor beast could move against it. In a log cabin, six miles from her nearest relative, lived a widow with five children. The supply of food was over, and as usual, the woman called the little one around her to hear the Scriptures, before commending them to the Heavenly Father’s care. Then bowing in prayer, she pleaded that help from God might come. Believing in the firm promises of God, she went to bed, without any care or fear for the morrow. Next morning, just as she went to the kitchen a man in a sleigh drove up to her house and enquired how they were getting along. In a short time he was told something of their destitution and of her cry to God for help. He replied, “Last night, about nine o’clock, my wife and I were both impressed that you were in need. Spending almost a sleepless night, I hastened at early dawn, to come and enquire about the case.” Then, taking from the sleigh, he handed over bread, meat and groceries to the mother to prepare breakfast for the kids. The stranger had never been in that house before, nor had he ever showed any interest in that woman, but he ever afterwards proved to be a friend indeed. At one level, why not put a sign like that in a church? Many churches are busy, hectic, confusing places. There are worship services to plan, educational programs to run, choirs to rehearse, fellowship dinners to organize, and outreach efforts to facilitate. There is a lot going on, and things can get frantic. The running joke in one church I know is that the staff keeps saying, "Next week it's going to get quiet," but the quiet week never comes. The work load can become a little bit crazy. Jesus experienced family ties and good-byes. So do we. According to Mark 3:20-35, Jesus was about to be confronted by his frustrated and conflicted family as crowds gathered around him to hear his stories, behold his miracles, and observe with great interest the conflicts he had with religious leaders from Jerusalem. Conflict. But there were also good, tender, and beautiful joys in Jesus' family. Look at the tenderness at the time of his birth. Good-byes and ties. All families have stress, as well as happiness, times of anger as well as times of joy, times of agony and times of ecstasy, times of good-bye as well as times when ties bind us together in bonds that seem unbreakable. We can all identify with both the ties and good-byes in Jesus' story, though the reasons for our joys and stresses may be quite different than those in his life. Our family joys often include good times when we are children -- vacations, play times with parents, special birthdays, and holidays. When marriage comes, it is often accompanied by smiles, tears of joy, blessings, affirmations, and congratulations. Family joys often include a baby being born. Babies usually bring big, broad smiles, a sense of mystery and wonder beyond words at the birth process and a sense of fulfillment. The baby's skin is so soft, we want to continually touch it. Cuddling, holding, and kissing the bundle of joy is a wonderful part of parenting. It feels right and good to protect a defenseless newborn. We want to care for this little miracle and plan for his or her future. Bonds and ties are formed in families of all kinds, colors, and cultures. Have you ever been misunderstood? Have you ever been misrepresented? Has anyone ever taken your words and motives and twisted them around and used them against you? If you live long enough in this world you are going to face that kind of a personal attack. I can remember an instance in another church when a certain group in that church took my preaching tapes and listened to them to find words and phrases they disagreed with. These disagreeable sayings were brought up in a business meeting and used to attack me personally. It hurt at the time, but it was a good lesson to me. It served to remind me that God's servants will be attacked. It also reminded me to think about my words before I say them because I might be called on to give an account of them. The earthly ministry of the Lord Jesus was surrounded by constant controversy. Nearly everyone He met misunderstood Him and what He came to this world to do. Nearly everyone was guilty of misrepresenting His words and His works. The things He did and said in love were used to attack Him in hate! Last night a friend of mine was talking about his father: he spoke of how, for many years, his father binged out, how his father was a drunkard - a man who when sober was kind and gentle - and when drunk - well he was something else again. He had no control over himself. And this kind and gentle man brought pain and suffering upon others, or at least the force within him did so - the family had to move - to change homes and communities - almost every year - landlords were cheated, employers disappointed, children neglected, friends abandoned - or embarrassed or betrayed. And this continued on until one day, after taking his children to Sunday School for a period of time, after witnessing the faith of others and what it did for them, he accepted Jesus into his life. 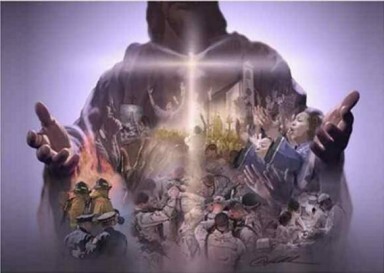 He asked God to take control, to guide his actions and save him from his sins and from the power of sin. And then things changed; debts still had to be paid, amends still had to be made, mistakes still occurred. But the inner man -the man that God made - was set free to grow and mature. No more booze, a lot more prayer. And the love and kindness of the man that could be glimpsed before - in the moments of sobriety - became apparent to all - for days, weeks, and finally years on end. The children who were still living at home stopped fearing what would happen next - they began to look forward to being with their father - they began to develop their own faith in God - a faith that still guides them to this day. This man, this father, this husband, experience a change in control - he went from being in the control of the devil to being in the control of God, and the result was the renewal of his inner nature, and in the end, when his earthly tent was destroyed, the result was a building from God - a house not made with hands - eternal in the heavens.. The scribes and Pharisees cannot deny what Jesus is doing; too many people have experienced it, too many people have been helped. So their strategy is to turn the people against Jesus by saying that He is ministering by the power of an evil spirit. It's sort of like Environmental groups in Canada receiving funding from people who want them to disrupt energy projects which conflict with their own financial interests. Or someone funding a Women's shelter with drug and prostitution money they make in their biker gang. You get the picture; suddenly the Environmentalist isn't the noble crusader anymore; the shelter benefits from the addiction and abuse it stands against. But it's not just a smear campaign that the Teachers of the Law are engaging in; they actually believe it. They are convinced that Jesus is in league with the devil because they can't see how it lines up with how God has worked in Israel in the past and how they understood the Law. Dr. Eugene Brice tells a delightful but disturbing story about a minister who returned to visit a church he had once served. He ran into Bill, who had been an elder and leader in the church, but who wasn't around anymore. The pastor asked, "Bill, what happened? You used to be there every time the doors opened." "Well, Pastor," said Bill, "a difference of opinion arose in the church. Some of us couldn't accept the final decision and we established a church of our own." "Is that where you worship now?" asked the pastor. "No," answered Bill, "we found that there, too, the people were not faithful and a small group of us began meeting in a rented hall at night." "Has that proven satisfactory?" asked the minister. "No, I can't say that it has," Bill responded. "Satan was active even in that fellowship, so my wife and I withdrew and began to worship on Sunday at home by ourselves." "Then at last you have found inner peace?" asked the pastor. "No, I'm afraid we haven't," said Bill. "Even my wife began to develop ideas I was not comfortable with, so now she worships in the northeast corner of the living room, and I am in the southwest." Last week I was reading a newspaper article on family values. The gist of the article was that everyone wants strong family values but few can agree on what they are. Then I heard Roger Rosenblatt on public radio being cynical about family values. Rosenblatt said that there are plenty of perfect families around like yours and mine. But, there are so many others that fall short, families like the Walker spy family or the Medicis in Italy or the Macbeths of Scotland or the Oedipus Rexes of Greece. Rosenblatt's point was that there is no perfect family and that family values have become so generalized they are meaningless. He said what is valuable in families is that they are normal people struggling to do good and be good, strengthening themselves by listening to each other, paying attention to other families, and encouraging each other to be fair, honest, and kind. Sounds like a decent list of family values to me, and even a single parent can do those things. Some of us, when we think of family, think of more ordinary things, like clusters of dog hair on clothes and hot dogs with everything smushed in the glove compartment and peanut butter on the television screen and aging grease on the hood over the stove. Whatever your view of the family and its values might be, Jesus wrecks it all. Jesus' words are like answering the doorbell and getting a bucket of ice water in the face. Kristin Borsgard Wee, Sermons for Sundays after Pentecost (First Third): Do You Love Me?, CSS Publishing Company, Inc. There is a positive message to be learned from these words of Jesus. The lesson is that we must keep ourselves alert to the way God is working in the world. Remember that those who were seeking to discredit Jesus were religious people. Their problem was that they just didn't expect God to be acting as Jesus said he was acting, so they missed the movement of God in their midst, and in fact, they called it evil. Today God may be speaking to us in causes that are unpopular, or in political events that cause us to feel threatened and insecure. The cries for justice and fairness in the world may come from quarters that we are not accustomed to listen to. We need to exercise diligence so that we don't miss the voice of God today just because it happens to be spoken by unfamiliar lips. I once sat in on a class my wife was taking in music appreciation. The instructor was asking the class members to listen for the recurring theme as it was passed from one instrument to another and was modified. I quickly lost it, but others in the class, who had benefited from their training, were able to keep track of the theme and even state which instrument was playing it. It is a law of life that we hear what we have trained ourselves to hear. What we must do is to train ourselves to listen for the voice of God in areas where we have not expected to hear it. We hear that voice only by attentive listening: by asking ourselves whether there is a valid message in those things which make us uncomfortable. Jesus spoke of an unforgivable sin, not because any act is unforgivable, but to warn us that our own hardness of heart can close the channels through which God's forgiveness flows and, as a consequence, leave us feeling alienated. Let us, therefore, affirm the good that is in others, so that our own hearts become generous and accepting of others, even as God is generous and accepting of us. M. H. Schubert shares the story about a group of fishermen in the Scottish highlands. They gathered for tea and discussed the day's catch. As a waitress set down a cup of tea, a hand accidently knocked it against the wall. It left an ugly stain. One of the guests got up, went to the wall, and began sketching around the stain with a crayon. What emerged was a stag with magnificent antlers. The man was Sir Edwin Landseer, England's foremost painter of animals. If an artist can transform an unsightly stain into a beautiful masterpiece, think what God can do with our sins. He absolves them and, in their place, refashions us toward full maturity. In Mark 3, those who try to turn the work of God into the work of the devil show by so doing that they are so far gone, so deeply enmeshed in a spiritually inverted reality, that there is no reaching them. Some of you will recall the dwarves as depicted by C.S. Lewis in the last book of the Narnia series. The dwarves had been brought by Aslan the Lion into the glories of the New Narnia, which stood for heaven or the kingdom of God. These stubborn dwarves sat smack in the middle of a sunlit meadow full of wildflowers and were being fed fruit and vegetables more exquisitely flavorful and fresh than anyone had ever before imagined was possible. Introduction: The readings for today, the Tenth Sunday [B] in Ordinary Time, give the name “sin” to our offenses against God. When we sin -- violate God’s Commandments -- we distance ourselves from Him; when we refuse, or fear, to admit our sins, we deny ourselves God’s freely offered pardon and forgiveness. Scripture lessons: In describing Adam and Eve’s first sin, disobedience, our first reading, taken from Genesis, explains the beginning of evil in the world with its destructive results. The loving relationship joining man to God is destroyed, and the relationship of mutual love between Adam and Eve is weakened. Their default to a “blame game” allowed each to avoid taking personal responsibility for their joint choice. In the second reading, Paul declares to the Corinthians that the many adversities of his missionary work were God’s plan for his spiritual growth; his sufferings, offered with Jesus for the Salvation of the world, would result a glorious reward for him and for all believers who did the same. Today’s Gospel passage reveals how Jesus himself was misunderstood by his own relatives and was criticized, slandered and rejected by the Sanhedrin-led scribes and Pharisees. His sufferings for us give us courage and his offer of healing, strength and forgiveness, so that we can do as he did when we face unfair treatment and criticism in our lives. Life messages: 1) Today’s Scriptures challenge us to face rejection with prophetic courage and optimism. Very often our friends, families, or childhood companions fail to listen to us and refuse to accept the words of grace, love and encouragement that we offer to them because they are too familiar with us. But we have to face such rejection with prophetic courage because by our Baptism we are called to be prophets like Jesus, sharing his prophetic mission. As prophets, our task is to speak the truth and oppose the evils in our society without condoning or encouraging sinful behavior even in our dear ones. 2) We need to have the courage of our convictions: Modern “liberal-minded” people may find genuine Christians’ belief in and practice of Christ’s ideas and ideals crazy too. Hence, what is needed in a Christian is the courage of his or her convictions based on the authority of Jesus as God and the truth of his doctrines. 3) We need to live as members of God’s family: Let us remember that by Baptism we become the children of God, brothers and sisters of Jesus and members of the Heavenly family of the Triune God. Hence, let us observe our obligations of treating others with love and respect and of sharing our love with them in corporal and spiritual works of mercy. We are also His disciples, and so are obliged to be hearers as well as doers of the word of God. Let us keep our souls daily cleansed and filled with the Spirit of God, leaving no space for the evil spirit to enter our souls. Introduction: The readings for today, the Tenth Sunday [B] in Ordinary Time, give the name “sin” to our offenses against God. When we sin -- violate His Commandments -- we distance ourselves from Him; when we refuse, or fear, to admit our sins, we deny ourselves God’s freely offered pardon and forgiveness. In describing Adam and Eve’s first sin, disobedience, our first reading, taken from Genesis, explains the beginning of evil in the world with its destructive results. The loving relationship joining man to God is destroyed, and the relationship of mutual love between Adam and Eve is weakened. Their default to a “blame game” allowed each to avoid taking personal responsibility for their joint choice. In the second reading, Paul declares to the Corinthians that the many adversities of his missionary work were God’s plan for his spiritual growth; his sufferings, offered with Jesus for the Salvation of the world, would result a glorious reward for him and for all believers who did the same. Today’s Gospel passage reveals how Jesus himself was misunderstood by his own relatives and was criticized, slandered and rejected by the Sanhedrin-led scribes and Pharisees. His sufferings for us give us courage and his offer of healing, strength and forgiveness, so that we can do as he did when we face unfair treatment and criticism in our lives. 2) “Whatever Became of Sin? “In his study of the subject, entitled, “Whatever Became of Sin? psychiatrist Karl Menninger stated that although sin was once a strong word, which described an ominous aspect of every human being’s life, life-plan and life-style, the word, along with the notion of sin has all but disappeared. The reality of sin, however, has not disappeared; it has simply been renamed. Sin may masquerade under several aliases, but it remains, nonetheless, what it is. For example, the sins of Auschwitz and Buchenwald, the sins of Vietnam, Bosnia and Rwanda have been hidden behind an acclaimed patriotism or other ideologies. Soldiers, who have systematically gang-raped and slaughtered helpless women have claimed justification for their actions due to the exigencies of war and their “moral obligation” to obey their superiors. Other heinous sins have been dismissed by excusing their perpetrators on ground of temporary insanity, or a troubled youth, or emotional instability. Some sins have been paraded under the guise of freedom of choice, ignorance, and aggressive or self-destructive behavior. Menninger suggested that one of the reasons that sin is not recognized and named for what it is may be due to the fact that the major responsibility for identifying and dealing with misbehavior has been taken over by the State. Much of what is really sin is now called crime, and actions which are blatantly immoral, are now labeled illegal. Murder, robbery, treason, adultery and lying have become defined as criminal acts with prescribed punishments. Because of this shift in responsibility, the consequences of sin have become depersonalized and the reality of sin as a breach in the relationship with God and with others has been overlooked. The readings for today’s liturgy invite the gathered assembly to take a hard look at sin, to call it by name and to take back our responsibility for it. Similarly, we are challenged to look evil in the eye and, without blinking, own it for the reality that it is. 3) Don’t allow rejection to derail your dreams: Brilliant British theologian G.K. Chesterton could not read until he was eight years old. A teacher said if his head were opened they would probably find a lump of fat where there was supposed to be a brain. That teacher was wrong. Einstein’s parents were informed by a teacher that he would never amount to anything. Beatrix Potter’s The Tale of Peter Rabbit, was rejected by seven publishers. Richard Bach got twenty rejection slips before Jonathan Livingston Seagull was published. Dr. Seuss, one of the most popular children’s authors of all time, got more than two dozen rejection slips before The Cat in the Hat made it to print. Ruth Graham felt an uncontrollable urge to run out of the meeting the first time she heard Billy Graham preach. She was not convinced of his preaching ability. She was put off by his preaching style. Billy had to improve his preaching before Ruth would become his wife. Today’s Gospel tells us how Jesus encountered rejection with prophetic courage. 4) Preachers rejected: Ezekiel and Jesus. Ezekiel was called to be both priest and prophet to God’s people during the most devastating time in their history. Six short years after he began preaching to Israel in the year 593 B.C., the holy city of Jerusalem was captured and destroyed, and just about every last person in Israel was carried off in chains to exile in Babylon. What is worse, Ezekiel saw it coming and told people. He told them it was God's way of punishing them for being so thick-skulled and hard-hearted (3.7). Predictably, they refused to listen. This was the good news according to Ezekiel! This was the hand God asked this preacher to play! The chosen people didn't believe him, of course, even when the Babylonians started setting fire to their homes and hacking down the carved pillars in their beautiful temple. They stubbornly denied the truth about themselves the whole time they were being dragged off, kicking and screaming to Babylon. And it was not until there, years later, with no Temple in which to offer sacrifice and no other sacred rituals permitted to them, that they began meeting in Ezekiel's house (8.1), where this bug-eyed prophet also learned how to become their priest. Softened up by the experience of desolation they could no longer deny, they began, for the first time, to listen to this old friend who had never given up on them and who reminded them of the God Who had no intention of giving up on them either. Today’s Gospel tells us how Jesus, the real Messiah, was rejected by his relatives and slandered by the Sanhedrin observers. The second reading (II Cor 4. 13-5) explained: In spite of the unfair criticism leveled against him and his gospel ministry by some Corinthian Christians, Paul is optimistic about his future and that of his critics, waiting for “eternal weight of glory beyond all comparison.” When Paul left for other mission venues, the Corinthian community was so flourishing that it got rather wild, and Paul wrote his first letter to them to correct some abuses. He promised another visit but changed his plans. This earned him serious criticism and ridicule from some Corinthians, so his second letter to them is somewhat defensive. He asserts his authority as an apostle (always in issue, given his late conversion), and seizes their criticism of his inconsistency to write a magnificent salute to the fidelity of God. Like the Psalmist, Paul clearly proclaims his Faith, affirming Life within himself despite death (2 Cor 4:10–11) and the Life-giving effect of his experience upon the Church (2 Cor 4:12, 14–15). Paul imagines God presenting him and them to Jesus at the Parousia and the judgment. In a series of contrasts Paul explains the extent of his Faith in Life. Life is not only already present and revealing itself (2 Cor 4:8–11, 16) but will outlast his experience of affliction and dying: this Life is eternal (2 Cor 4:17–18). 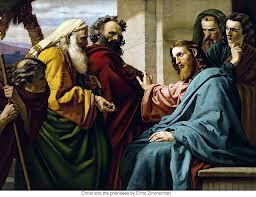 Paul is still speaking of himself personally, but he assumes his Faith and attitude will be shared by all Christians. The renewal already taking place, even in Paul’s dying, is a share in the Life of Jesus, but this is recognized only by Faith (2 Cor 4:13, 18; 2 Cor 5:7). (USCCB commentary). Gospel exegesis: The context: The well-loved carpenter turned crazy preacher? Putting evil in its place and naming sin for what it is, Jesus reminds us in today’s Gospel, that sin and evil must be confronted whether it is in ourselves, our relatives, our friends or our enemies. The first part of today’s Gospel tells us how Jesus’ relatives and fellow-villagers wrongly judged him as out of his mind and consequently tried to take him by force back to Nazareth to do his safe and secure job as a good carpenter. That is why Jesus remarked, “A man's enemies will be the members of his own household.” (Matthew 10:36). There were four reasons why Jesus’ people thought he was mad and attempted to dissuade him from his preaching and healing mission. First, Jesus had abandoned his safe and secure job as a much-needed village carpenter with steady income to become a wandering preacher with no residence or steady income. Second, Jesus had chosen a band of fishermen with no political or social influence, a hated tax-collector and a fanatic zealot as his disciples. Third, Jesus had begun to criticize the power lobby - the scribes and Pharisees - in the Jewish religious headquarters, Jerusalem, labeling them hypocrites. Jesus’ relatives might really have been afraid that Jesus would be arrested, and they would be persecuted with him for criticizing those in power. Fourth, Jesus had silently claimed to be the long-awaited Messiah and had worked miracles to support his claim. The Sanhedrin slander refuted: The second part of today’s Gospel passage gives Jesus’ crushing reply to the slander propagated by the observers sent from the Sanhedrin, that Jesus expelled devils using the assistance of the leader of devils. Jesus refutes the false allegation raised against him by the Sanhedrin scribes with three counter-arguments and a warning: 1) A house divided against itself will perish, and a country engaged in civil war will be ruined. Hence, Satan will not fight against Satan by helping Jesus to expel his coworkers. 2) If Jesus is collaborating with Satan to exorcise minor demons, then the Jewish exorcists are doing the same. 3) Jesus claims that he is using the power of his Heavenly Father to evict devils just as a strong man guards a house and its possessions from the thief. 4) Finally, Jesus gives a crushing blow to his accusers, warning them that by telling blatant lies they are blaspheming against the Holy Spirit and, hence, their sins are unforgivable. Did Jesus have brothers and sisters? Catholic Church teaches that Jesus did not have blood brothers and sisters. The problem arises because we read in Mark about the crowd asking, "Isn't this the carpenter, the son of Mary, a brother of James and Joses and Judas and Simon? Aren't his sisters our neighbors here?" (Mk 6:3). A similar reference occurs earlier in Mk 3:31 — "His mother and brothers arrived...." At first hearing, the words seem to state that Jesus did indeed have blood brothers and sisters. But the Greek word adelphos, was used to describe brothers not born of the same parents, like a half-brother or step-brother. The word also described other relationships like cousins, nephews, etc. For example, in Genesis 13:8 and 14:14-16, the word adelphos was used to describe the relationship between Abraham and his nephew Lot and the relation between Laban and his nephew Jacob. In the Gospel, Mary of Clopas is called "the sister" of Mary, the Mother of Jesus where sister means only a cousin. In Hebrew and Aramaic languages, no special word existed for cousin, nephew, half-brother, or step-brother. So, they used the word brother in all these cases. The Greek translation of the Hebrew texts used the word adelphos. In addition, other Gospel passages clarify these relationships between James, Joses, Judas, and Simon. James the Less and Joses were the sons of Mary the wife of Clopas (Mk 15:40, Jn 19:25), and James the Less was also identified as "the son of Alphaeus" (Lk 6:15), a synonym of “Clopas." James the Greater and John were the sons of Zebedee with a mother other than our Blessed Mother Mary (Mt 20:20ff). After the birth of our Lord, although the Gospels do not give us many details of Jesus’ childhood, no mention is made of Mary and Joseph ever having other children. Never does it refer to the "sons of Mary" or "a son of Mary," but only the son of Mary. By this time, St. Joseph has died. Since Jesus, the first-born, had no "blood brother," when He was hanging on the cross, He entrusted Mary to the care of St. John, the Beloved Disciple. Interestingly, the Orthodox Churches solve this problem over brothers and sisters by speculating that St. Joseph was an elderly widower who had other children before he married Mary. The earliest explanation of who the brothers and sisters were, found in the second-century document known as The Protoevagelium of James, is that they were stepbrothers through Joseph. According to this document, Joseph was an elderly widower who agreed to become the guardian of Mary, a consecrated virgin. Being elderly and already having children, he was not seeking to raise a new family and so was an appropriate guardian for a virgin. This theory is consistent with Joseph’s apparent death before the ministry of Jesus. It is the standard explanation in Eastern Christendom of who the brethren of Christ are. Shortly before the year 400, St. Jerome began to popularize the view that the brethren of Christ were cousins, and this view became common in the West. Nevertheless, the Catholic Church has faithfully taught that Mary gave birth only to Jesus, whom she had conceived by the power of the Holy Spirit. Life messages: 1) Today’s Scriptures challenge us to face rejection with prophetic courage and optimism. Very often our friends, families, or childhood companions fail to listen to us and refuse to accept the words of grace, love and encouragement that we offer to them because they are too familiar with us. Hence, they are unable to see us as God's appointed instruments, the agents of God's healing and saving grace. But we have to face such rejection with prophetic courage because by our Baptism we are called to be prophets like Jesus, sharing his prophetic mission. As prophets, our task is to speak the truth and oppose the evils in our society without condoning or encouraging sinful behavior even in our dear ones. Let us also acknowledge, appreciate and encourage the prophets of our time who stand for truth and justice in our society with the wisdom of God in their heads, the power of the Holy Spirit in their words and the courage of God in their actions. 2) We need to have the courage of our convictions: Modern “liberal-minded” people may find genuine Christians’ belief in and practice of Christ’s ideas and ideals crazy too. Hence, what is needed in a Christian is the courage of his or her convictions based on the authority of Jesus as God and the truth of his doctrines. Many saints, following Christ's example, have been taken for madmen--but they were mad with love, mad with love for Jesus Christ. 2) We need to fill our minds with the Holy Spirit: Jesus teaches that we can be influenced by the evil spirit if we listen to him and follow him. Hence, we have to keep our souls daily cleansed and filled with the Spirit of God, leaving no space for the evil spirit to enter our souls. 3) We need to live as members of God’s family: Let us remember that by Baptism we become the children of God, brothers and sisters of Jesus and members of the Heavenly family of the Triune God. Hence, let us observe our obligations of treating others with love and respect and of sharing our love with them in corporal and spiritual works of mercy. We are also His disciples, and so are obliged to be hearers as well as doers of the word of God. Joke of the Week: Rejection at the Pearly Gate, too: A cab driver reaches the Pearly Gates and announces his presence to St. Peter, who looks him up in his Big Book. Upon reading the entry for the cabby, St. Peter invites him to grab a silk robe and a golden staff and to proceed into Heaven. A preacher is next in line behind the cabby and has been watching these proceedings with interest. He announces himself to St. Peter. Upon scanning the preacher's entry in the Big Book, St. Peter furrows his brow and says, "Okay, we'll let you in, but take that cotton robe and wooden staff." The preacher is astonished and replies, "But I am a man of the cloth. You gave that cab driver a gold staff and a silk robe. Surely, I rate higher than a cabby." St. Peter responded matter-of-factly: "Here we are interested in results. When you preached, people slept. When the cabby drove his taxi, people prayed." 1) Rejection hurts: Arnold Palmer played his last Master’s Tournament in 2002. Palmer, who won the Master’s in 1958, 1960, 1962, and 1964, had seen his game slip away with age and his stardom fade with the rise of Tiger Woods and Phil Mickelson. A reporter asked Palmer, “Why did you do it? Why did you quit?” To which Palmer replied, “I didn’t want to get the letter that former champions Ford, Brewer, and Casper have already received asking them to step down.” Whether it’s that girl in elementary school who looked at you in disdain when you offered her a Valentine card, or the boss that suggests you are not included in the company’s new plans, rejection hurts. It causes pain. Yet, Jesus faced rejection heroically and said it’s going to happen and we will be wise to live with it, for “Blessed are you when people insult you, persecute you and falsely say all kinds of evil against you because of Me.” There is some rejection that’s worth the cost. Guys are always bragging about who’s the strongest. Since 1977 there has been a televised event called “The World’s Strongest Man.” Most of the winners have come from Finland, Iceland, and Eastern Europe. These guys are required to perform amazing feats of strength like pulling a Boeing 747 with their teeth. These aren’t body-builders; they are bulked up dudes. One of the competitors from Iceland, who is nicknamed Thor, stands 6’9” and weighs 435 pounds. No six-pack abs on these guys, they go for the full keg! So, who do you think was the strongest man in the Bible? Are you thinking of the book of Judges and the guy with long hair who could kill a lion with his bare hands? Samson was pretty strong, but after he got a haircut in the devil’s barbershop, he lost his strength. In our passage today, Jesus is going to talk about a strong man; then He’s going to mention a stronger man. Jesus claims that God his Father is “The World’s Strongest Man” who would protect us from the evil one. (Rev. David Duke). 3) A house divided against itself cannot stand." On June 16, 1858 more than 1,000 delegates met in the Springfield, Illinois, for the Republican State Convention, and they chose Abraham Lincoln as their candidate for the U.S. Senate, running against Democrat Stephen A. Douglas. That evening Lincoln delivered this address to his Republican colleagues and the main focus of his remarks were on the issue of slavery: “Mr. President and Gentlemen of the Convention. If we could first know where we are, and whither we are tending, we could then better judge what to do, and how to do it. We are now far into the fifth year since a policy was initiated, with the avowed object, and confident promise, of putting an end to slavery agitation. Under the operation of that policy, that agitation has not only, NOT ceased, but has constantly augmented. In my opinion, it will not cease, until a crisis shall have been reached, and passed. ‘A house divided against itself cannot stand." "A house divided against itself cannot stand.’" That's a powerful sentence! Did Abraham Lincoln come up with that phrase all by himself? No. Well, where did he get it? That’s right … he was quoting Jesus and the quote is from today’s Gospel where Jesus gives a crushing blow to the Scribes who accused Jesus of collaborating with Beelzebub for his exorcisms. 4) ‘United We Stand Divided We Fall’: I read about a Church that had grown to the point of needing a new building. After the building was completed, a disagreement arose about which side of the auditorium they should put the piano. Words were exchanged, tempers flared, and the Church ultimately split. The side that “won” kept the building, but they no longer needed the extra seating and could not afford to pay the mortgage … so they had to sell it. (Tim Seevers, in The Pleasant Viewer June 2000). And I also have read about another Church down in Texas where folks go so mad at each other that the Church split and then they fought over the property. Each group filed lawsuits against the other group. During a hearing, it was discovered that the conflict had begun years before at a church dinner (pause) when an elder was served a smaller piece of ham than the child seated next to him. (Jim Belcher, 10/12/09 Sermoncentral.com article).